In Democracy Remixed, award-winning scholar Cathy J. Cohen offers an authoritative and empirically powerful analysis of the state of black youth in America today. Utilizing the results from the Black Youth Project, a groundbreaking nationwide survey, Cohen focuses on what young Black Americans actually experience and think--and underscores the political repercussions. Featuring stories from cities across the country, she reveals that black youth want, in large part, what most Americans want--a good job, a fulfilling life, safety, respect, and equality. But while this generation has much in common with the rest of America, they also believe that equality does not yet exist, at least not in their lives. Many believe that they are treated as second-class citizens. Moreover, for many the future seems bleak when they look at their neighborhoods, their schools, and even their own lives and choices. Through their words, these young people provide a complex and balanced picture of the intersection of opportunity and discrimination in their lives. 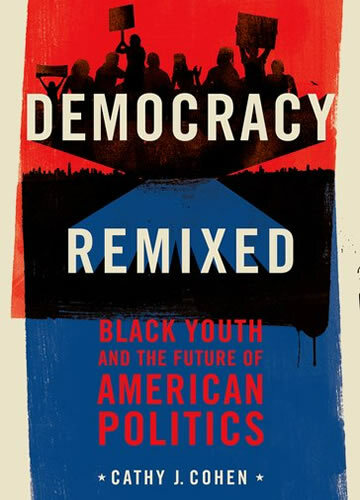 Democracy Remixed provides the insight we need to transform the future of young Black Americans and American democracy.